We just placed an order for new underwater cameras, to be used aboard this season’s great white shark expeditions to San Francisco’s Farallon Islands. Any shark images and shark video captured aboard our one-day cage diving expeditions will be shared with shark dive participants. No dive experience is required. We utilize a floating shark cage and surface-supplied air, and a certified dive professional teaches you what you need to know. Trips depart on select dates from Pier 40, next to AT&T Park. Our first trip of the season is Saturday, September 30th. Click here for additional trip dates and online booking. 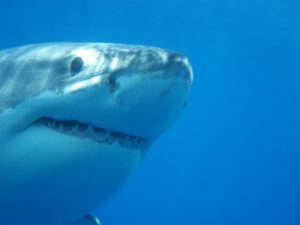 Shark Dive Adventures offers shark encounters around the world and is a division of the adventure travel company Incredible Adventures which has been making dreams come true since 1993.